Heat oven to 400 degrees. Scrub potatoes clean and pierce a few times with a fork. Place in the microwave and cook for 9-12 minutes until sweet potatoes are tender. Remove from microwave and cool slightly. Meanwhile, in a medium skillet, sauté shallot, garlic, thyme and rosemary in one tablespoon butter until tender (5-8 minutes). Season with salt and pepper. Set aside. Slice each sweet potato in half and scoop out cooked sweet potato flesh, leaving enough of the sides to keep sweet potatoes firm (like a canoe!). Place sweet potato flesh in a bowl along with cooked shallot mixture, 2 tablespoons softened butter, egg and Brie. Using an electric mixer, mix until smooth. 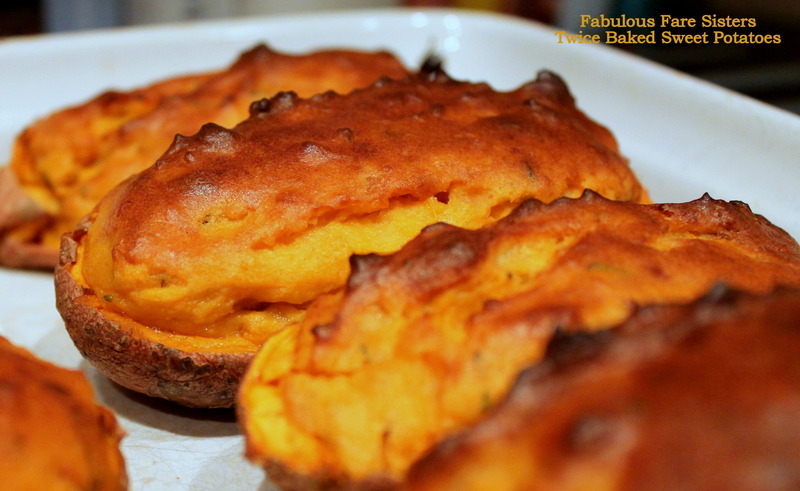 Scoop sweet potato-Brie mixture into sweet potato canoes. Bake in heated oven 20-25 minutes until nicely browned and puffed. Enjoy a delicious side of Sweet Potatoes! Sweet potatoes are literally my favourite thing in the world, I could literally live on them! Great minds think alike. I have a variation coming up in the alphabet. Nom, nom. i made these years ago! This is a great recipe must try again! I love these and mom used to make them yumm!